The collect and readings for today, the Second Sunday after Pentecost, Proper 5C, may be found here. The sermon below is based on today’s old testament and gospel readings. Soon after healing the centurion’s slave, Jesus went to a town called Nain, and his disciples and a large crowd went with him. As he approached the gate of the town, a man who had died was being carried out. He was his mother’s only son, and she was a widow; and with her was a large crowd from the town. When the Lord saw her, he had compassion for her and said to her, “Do not weep.” Then he came forward and touched the bier, and the bearers stood still. And he said, “Young man, I say to you, rise!” The dead man sat up and began to speak, and Jesus gave him to his mother. Fear seized all of them; and they glorified God, saying, “A great prophet has risen among us!” and “God has looked favorably on his people!” This word about him spread throughout Judea and all the surrounding country. A widow stands at the gate of Zarephath. She is looking for a couple of sticks. Drought has dried up the land so they should not be too hard to find. The drought has affected everything. Wells are dry and crops have failed. Her life is as dry and parched as the land. No food. No water. No future. She will build a two or three stick fire. It does not need to be large. She has only a handful of meal and a little oil. She will bake some bread. It will be the last meal. She and her son will eat, she tells Elijah, and die. Another widow walks with a crowd of people to the gate of Nain. It is a funeral procession for her son, her only son. With no husband and now no son she has no identity, no sense of place or belonging. Her security is gone. She is alone and on her own and, whether it is first century Palestine or today, that is a risky place to be. These stories are not just about widows. They are about life and the God who meets us in the struggles and challenges of life. These stories are as real today as the day they happened. People live these stories everyday. This past week I was at a meeting in which a woman spoke about the death of her child. She said she often fantasized about and asked God that her son might be given back to her on the fifth anniversary of his death. She only wants what the widow of Nain got. Who can blame her? She wants the life she used to have. She wants the sense of meaning, belonging, and relationship that used to be. She wants to be told, “Do not weep” and to hear the words, “Young man, I say to you, rise.” She wants her son and her life to be given back to her. She only wants what the widow of Zarephath got. Who can blame her? She wants the emptiness, hunger, and famine of her life to go away. She longs for the jar of meal that will not be emptied and the jug oil that will not fail. She wants the abundance and fullness of life. Like the widows of Nain and Zarephath she stands at the city gate, the place of change and transition, the place where people and life come and go. She is really no different from us. The circumstances may be different but like her we too have stood at the city gate watching life change and seemingly slip away. Sometimes it is the death of a loved one or the end of a marriage. Other times it is the loss of a dream, our health, financial security, or the end of a career. Whenever we seem to have lost our way, our faith, meaning, identity, or enthusiasm for life we stand at the city gate. More often than not, it seems, we stand at the city gate wishing that things could be different, fantasizing what it would be like if only…. If only we could have given back to us the people and parts of our lives that have died. It is not just as individuals that we wish we could go back to the way it used to be. Many in the Episcopal Church and Anglican Communion speak with great longing about what it used to be like. Even here at St. Philip’s there is the hope that our school would become what it used to be ten, fifteen, or twenty years ago. Certainly the people along the Gulf coast wish life could go back to the way it was before the explosion and oil spill. No doubt the widows in our readings wanted to go back to the way it was before. Before death. Before famine. Before life brought them to the city gate. We must not, however, take today’s old testament and gospel stories literally. Otherwise we will surely stand at the city gate waiting for Elijah or Jesus to come along and turn back time. We will be waiting for the magic and fantasy of a fifth year anniversary, whatever that may look like in our lives. We must, however, take these stories seriously. A literal reading of the stories makes them nothing more than news casts of past events. It leaves us wondering, “Why them and not me?” To take them seriously keeps them alive and relevant to us today. It makes them our stories. To take these stories literally places the focus on the widows and what they got. However, to take these stories seriously places the focus on Elijah, Jesus, and what God is doing in our lives and world. That is what the two widows do. In neither story do the widows point to themselves or speak about what they got – sons, meal, oil. They direct their and our attention to God’s presence, faithfulness, and words. They bear witness to and glorify the God who meets us at our city gates. The city gate is a place of change and loss but that is not its ultimate meaning. It is, rather, the place where God’s prophets meet God’s people. It is the place where the funeral processions of our lives are interrupted and stopped by Jesus’ procession of life. It is the place of divine compassion. It is the place of prophecy. Prophecy at the city gate is not about predicting the future or turning back time. Instead, prophecy, in some way, makes the future present and redeems the past. Prophecy gives us a glimpse of what God sees and desires for us. It reveals the world through God’s eyes and describes it with God’s words. Sometimes prophecy criticizes and judges our world and relationships. That is not, however, the prophecy in today’s stories. That is not what prophecy is like at the city gate. Prophecy at the city gate is energizing. It acknowledges the reality of our struggles and challenges and then points a way forward. 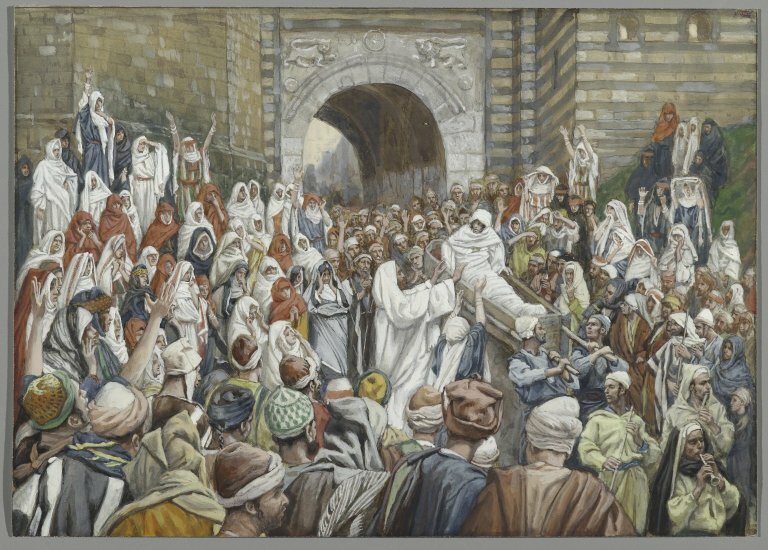 Prophecy at the city gate offers life in the midst of death, hope in despair, joy in sorrow, presence in absence. Prophecy at the city gate is a light shining in the darkness. It says to us that God has looked favorably on his people; that he has noticed us and has come to help. Prophecy at the city gate charts a direction and a way forward. Who, then, are our prophets? Certainly Elijah and Jesus continue as God’s prophets speaking words of life. In more modern times Mother Teresa, Gandhi, Martin Luther King, Jr., and Archbishop Romero have spoken good words in bad times, revealing God’s life in the midst of injustice, violence, and divisiveness, and calling us to a new level of consciousness. Other prophets are more local even anonymous. They are the volunteers who show up at the Uvalde Food Pantry proclaiming dignity in the midst of poverty, offering nourishment of body and soul in the midst of hunger. Local prophets are the ones who have sat with us as we wept. Their presence was enough to give us the courage and hope to meet the days ahead. They are the ones who offered a word of encouragement that gave us the confidence and the will to get up and live another day. These prophets have spoken God’s presence by their lives and sometimes their words. They have experienced God and they offer us their experience as a way forward when we cannot find it for ourselves. Who are the prophets in today’s stories? Obviously Elijah and Jesus. Less obviously are the two widows. These two anonymous woman have stood at the city gate. Of all places God might be, he was there. They remind us we never stand there alone. They proclaim the city gate to be a place of beginnings more than a place of endings. If they can stand at the city gate and live to tell about it. So can we. So should we. I cherish the stories of the nameless and the widows. Who else is more entitled to speak to us? Who is most likely to understand us? And who is best to represent us in our times of need. Listen and be encouraged by these faceless souls who encounter God. Corey, it seems that at some level we are all nameless and widows. To know that about ourselves take us to the gate of God’s entry into our lives.